Thank you for tuning in to Part 3 of this series on how to write advertising copy without sounding like the kind of salesperson you normally try to avoid. Check out Part 1 and Part 2 if you missed ’em. 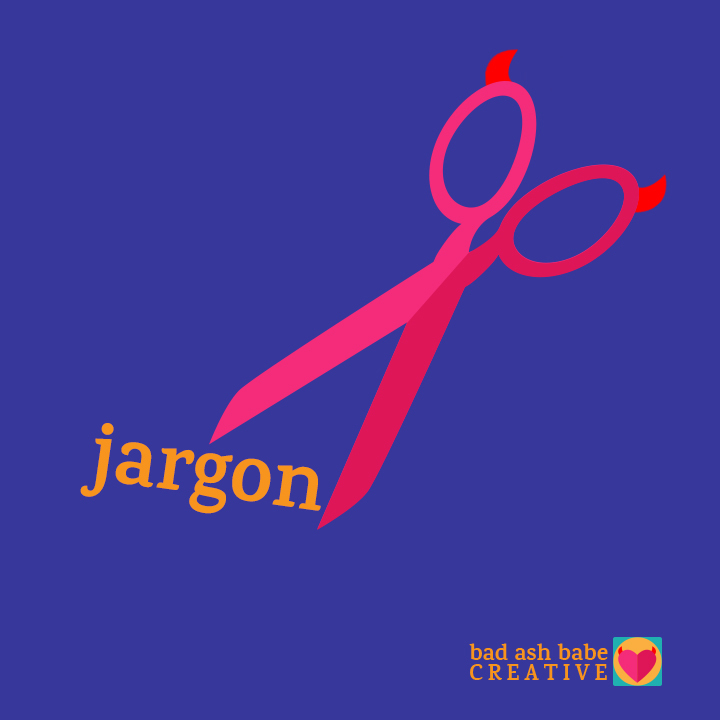 Slay the Jargon. Kill the Buzz. Corporate jargon and business buzz words are especially tempting to include in sales copy. Partly because these kinds of words legitimately describe concepts related to what we’re selling. And partly because we’re used to being on the receiving end of jargon-laden copy. There’s also a tendency, whether conscious or not, to assume that using these words make us sound credible and trendy. These words are not meaningless. Quite the contrary, they describe very specific things. And are appropriate (if even still annoying) in a blog post or a book. But not so much in ad copy. Why? Because most people are already on the defense when propositioned to part with their time or money for the thing that may or may not improve their lives. So trying to influence them with words that sound like a boardroom invention (even the Silicon Valley free-snacks-and-foosball kind) probably isn’t an effective method for gaining their trust and making them like you. In reality, we can’t always escape jargon and buzz words. Sometimes they stick and become part of our vernacular. I initially found words like content and branding to be absolutely abhorrent and soulless excuses for nouns. But now I use them all the time. They describe a thing in a way no other word does at the moment. And so into the vocabulary they go. Once in awhile one of these words might actually resonate with you. As, for instance, badass does with me. If that is the case, use it. Because you’re not faking it at that point, you’re owning it. And that’s #authenticAF. Try this: If you must use some jargon when addressing a lay audience, consider defining it on first mention. Also, if you can’t help but use a trendy buzz word in your sales copy because it is so perfect for your brand, then use it. But like the exclamation restraint equation, try to keep it to one buzz per 300 words. Sometimes writing about your product or service in the simplest, most basic of terms first will take you in a better direction than straining to win some sort of award with your verbal brilliance. Which usually ends up sounding void of any actual meaning. Or it’s just obvious that you’re trying too hard. Once you’re in the mode of explaining things in basic terms, if there IS any brilliance to be had, it’ll come when you’re not forcing it. And if no wild wordsmithing inspiration comes to you, no problem. You’ve described your offering in a straightforward and honest manner. That’s the most important thing. 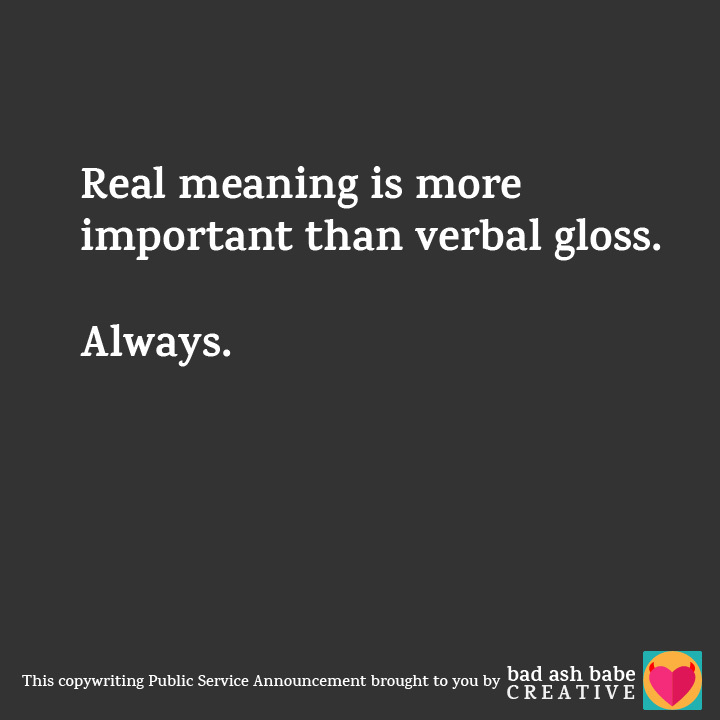 Real meaning is more important than verbal gloss. Always. What follows will likely come out sloppy at first. But sloppy can be tidied. And it’s way better than not saying much of anything at all. Our next, and final (for now) installment in the How to Write Advertising Copy Without Losing Your Soul series. Have something to add? 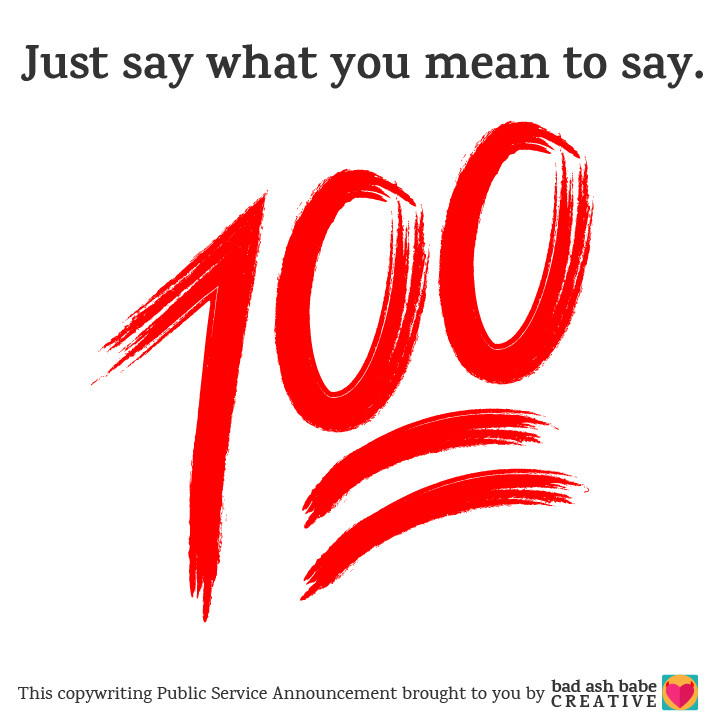 By all means, say what you gotta say in the comments below!